They ask you what you think of dueling. If you reply that it is far better to forgive a man than to fight a duel with him, but that even a duel might be better than a lifelong enmity which leads to continuous secret efforts to ‘do the man down,’ they complain that you have not given them a straight answer. V.G. Keirnan’s book The Duel in European History has certain strengths but lacks some of the necessary subtlety that Lewis urges. He has a lot of juicy gems and some incisive points. He searches for a unified field theory of dueling, which I admire. He seems to think that dueling’s best explanation lies in a quasi-Marxist theory of maintaining class dominance, which fails in my view for a few reasons. Of course dueling had something to do with class, but not always. Of course dueling is wrong, but . . . maybe not always? Some personal examples . . . I had a good friend growing up and we did various things together. Around our freshman year we decided to add some spice to our various games of ping-pong, poker, H-O-R-S-E, or video games. We invented consequences for the loser of these contests. These consequences either brought great discomfort (put hot pepper on your tongue for five minutes, run barefoot in the snow, eat a spoonful of mustard, etc. ), or great embarrassment (fall down dramatically in a restaurant, sing loudly in the middle of the street, etc.). Looking back, many of these things were essentially harmless and created some good memories. I should say too that losing brought no shame, but to back out of the “consequence” would have been unthinkable and damaging to the friendship. You made a pledge, now see it through. In college I remember walking into my dorm room one day and seeing my roommate and another guy on the hall wrestling. It was not purely play, neither were they “fighting” in any real sense of the word. They engaged in something in between those two. Some sort of personal disagreement lie at the heart of this–I have no idea what. I stayed to watch. Keirnan might want to ascribe the fact that I watched to some sort of love of destructive spectacle. Obviously I preferred watching the “match” to opening my biology textbook. Keirnan has a point. But I also stayed to act as a kind of “second” for my roommate should level of fighting go too far. Soon enough a few others came and watched, much for the same reasons, I’m sure. After several minutes one of them agreed to say “uncle” and they stopped. Commendations for both participants flowed from the audience. It seemed entirely natural that now we should all go to dinner, and the first 15 minutes of conversation had most of us laughing about this or that moment in their match. The two participants seemed entirely reconciled and never again had another such incident. One of them had “lost,” but that carried no consequence. I would love to know what Keirnan would think about this “duel.” Can duels ever be good for you or society, and if so, why? To answer this question we need to think about why duels happen in the first place. Most duels occur inextricably bound up with the sin of pride. Perhaps this, even more so than the violence, explains their consistent condemnation by the Church. Many duels bring death or grave physical harm that had no relation to the nature of the “offense” that caused the duel in the first place. For example, towards the end of the era of dueling poets and musicians fought over particular points of artistic criticism. At certain points in history duels happened not to settle disputes, but to prove manhood or courage. Duels might then morph almost into a way of life–a way of life that can only end in death. And yes, Keirnan has a point about the “social-control” aspect of dueling as its link to aristocracies. Democratic peoples resort to dueling at a vastly lower rate than aristocratic nations, and this tells us something. None of this surprises the reader. But Keirnan has more interesting parts of his book. From his tour through the history of the duel, we may guess at when duels tend to emerge more so than other times. First, it appears that the amount duels rose in times of significant cultural and political shift. Two main examples hint at this possibility. First, dueling increased in the 17th century as the power of monarchs increased. Increased power to the king meant perhaps that aristocrats felt the need to “strut their stuff” and duel more often. They may have had the political motive of settling disputes outside of royal courts–an act of survival. In his eyewitness account of the English Civil War, Edward Hyde, the Earl of Clarendon, spends his first chapter criticizing the government of Charles I. One might suppose that certain policies impoverished England and this led to rebellion. In fact, as Hyde and other historians point out, England enjoyed relative prosperity during Parliament’s long exile under Charles. The problem lay not in the suffering of the country, but in part in its lack of suffering. At length Hyde argues that Charles’ chief error lay in not giving England’s political class anything to do for several years. They had nothing to do in part because times were good in most respects. In other words, boredom and restlessness helped lead to the Civil War. Keirnan mentions this as well at certain points in his narrative, and this rings true with my own experience that I mentioned above. At some point, things got stale and we wanted to liven them up. But I keep coming back to the question of the possible validity of some kinds of duels. I had a long talk with my wife about this and she brought up several interesting questions about my experiences. “Couldn’t we have had mercy on one another and forgiven the consequence?” I answered that would not have been possible. True, many duelists had “mercy” on their combatant by firing in the air or some other such method. But this was possible because they had already “won” by showing up and standing for the contest. Victory was a side benefit. They had already proven themselves. For my friend and I, we could only prove ourselves by going through with the consequence. That was the whole point. When reminiscing about what happened we never said, “Remember that time you made that shot and won at H-O-R-S-E?” Instead we reflected, “Remember that time when your feet bled from running in the snow, or when I had to sing the Police’s “Roxanne” in the middle of my street?” Going through with the consequence gained us fame, not winning the contest. So on the one hand we “proved ourselves” as “men” without doing any real harm to ourselves or others. We bonded over this. But on the other hand, it had all the negatives I listed above. I still wonder about the possible ancillary benefits of duels. Amidst the many reasons for duels–obscene pride, class control, the destructive impulse, etc.–what stands out to me most is boredom. In some way, shape, or form, deep down we know that we need to suffer to be who we need to be. Democracies don’t encourage suffering in any way. We are told to gratify our desires. Most modern American manifestations of Protestantism have no concept of voluntary suffering and many churches do all they can to accommodate, not challenge, the modern man. I think if we can recover the true purpose and place of suffering, we may get closer than Keirnan to understanding duels. And it is here that I must demur, for I have been a somewhat silly teenager, but I am not a saint. *I generally disagree with Marxist interpretations of history but they sometimes have merit. Kiernan’s class emphasis makes historical sense, but not logical sense–at least to me. Aristocrats have power because of their birth. They do not need to “earn” it in the modern sense of the word. Clearly dueling at times served a purpose of validating their status as aristocrats. But why feel this need? Again, they never had to earn their status in the first place. Perhaps the duel represented for some a kind of atonement oriented suffering for their societal position? Perhaps this might allow them to feel that they had “earned” their role? I wonder why democracies eschew the duel. After all, in theory all of their citizens are born equal and must distinguish themselves in some way from their fellow man. **In fact I believe this happened once and only once in our years of performing “consequences” and I was the lucky recipient. If memory serves, we were playing some kind of basketball video game and I had lost multiple times, which meant I had to drink a concoction consisting (I think) of raw egg, tabasco sauce, and mustard. But my friend did not simply just “forgive” this consequence. Rather, he had to back out of plans we had made for the following day and in compensation released me from drinking the miserable concoction. Needless to say, however grave and disappointed I made myself sound when he told me this, I accepted his offer quite readily! Enter Norbert Elias to answer this, and other perplexing questions about European aristocratic life in the age of Louis XIV and beyond. His book The Court Society sets out to give the European aristocracy a context in which they lived. They had reasons for their actions, reasons that made at least some sense in their world. And like any other system, the seeds of its destruction embedded themselves right within the virtues the aristocracy practiced. By early on in the book one realizes that, yes, the aristocracy did have “jobs.” Of course menial/”blue collar” labor remained beneath them, but each member of an aristocratic household had charge of the family name, and advancing that family name. Americans have little concept of this, but once we understand this idea, most everything else about the aristocracy falls into place. I must really tell you how just the King is. The Duchesse de Bourgogne’s ladies, who are called Ladies of the Palace, tried to arrogate the rank and take the place of my ladies everywhere. Such a thing was never done either in the time of the Queen or of the Dauphiness. They got the King’s Guards to keep their places and push back the chairs belonging to my ladies. I complained first of all to the Duc de Noailles, who replied that it was the King’s order. Then I went immediately to the King and said to him, “May I ask your Majesty if it is by your orders that my ladies have now no place or rank as they used to have? If it is your desire, I have nothing more to say, because I only wish to obey you, but your Majesty knows that formerly when the Queen and the Dauphiness were alive the Ladies of the Palace had no rank, and my Maids of Honour, Gentlemen of Honour, and Ladies of the Robe had their places like those of the Queen and the Dauphiness. I do not know why the Ladies of the Palace should pretend to anything else.” The King became quite red, and replied, “I have given no such order, who said that I had?” “The Maréchal de Noailles,” I replied. The King asked him why he had said such a thing, and he denied it entirely. “I am willing to believe, since you say so,” l replied, “that my lackey misunderstood you, but as the King has given no such orders, see that your Guards don’t keep places for those ladies and hinder my servants from carrying chairs for my service,” as we say here. Although these ladies are high in favour, the King, nevertheless, sent the majordomo to find out how things should be done. I told him, and it will not happen again. These women are becoming far too insolent now that they are in favour, and they imagined that I would not have the courage to report the matter to the King. But I shall not lose my rank nor prerogatives on account of the favour they enjoy. The King is too just for that. The greatness of the “House” depended on the greatness of the family, which explains why Darcy would have hesitated to be in their company. A man of Darcy’s status would naturally hesitate to confer “honor” to Elizabeth’s family by visiting, or especially dancing, which would have conferred an extra measure of approval for their “low status” behavior. And with Elizabeth’s family’s status teetering on the brink, one can then see how potentially damaging Lydia’s behavior would be later in the book. Elias points out that the aristocracy needed to visit others not only to forge connections and give and receive honor, but also to understand their place in the social hierarchy. Take fashion, for example. One should always dress appropriate to one’s station, never above it or below. But the appropriate dress might shift over time depending on how others dressed and what approval they received from those above them. A lord “goes for broke” and wears a cravat a bit frillier than he might normally while visiting a duke. The duke gives his tacit approval by wearing an even more outlandish cravat, and now everyone must level jump on their cravat’s. Suddenly, the “normal” cravat another lord wears is out of fashion — he now dresses as a bore. If he had been invited to more places and been busier with his “job” he would have known this. His family’s status declines. Hence the near obsession with the aristocracy with visiting and being visited. It was the only way to have “information,” to use a phrase Austen’s Emma frequently uttered. Family status often had little to do with money. No aristocrat worth his salt would stoop to such vulgar behavior as to actually care about money. I believe Saint-Simon relates a story of one baron who gave his son some money to spend on the town. When the son returned with money leftover he received harsh criticism from his father, who then threw the remaining money out of the window. In returning with money the son showed not prudence, but foolishness. Anyone who looked like they counted their money might look like they cared about money, and that stigma would hurt their reputation severely. Americans often get accused, and rightly so, of focusing way too much on money, which proves our essential boorishness as a nation. We have to see this malady in some ways as a by-product of equality. Americans for the most part have no built in social framework for support, no “society” (to use another term from Emma) where we can claim membership. Money, therefore, more so than family or connections, becomes our primary, if not our only tool, to keep us afloat. The charge against us is just, but the charge is easier to avoid in aristocratic societies. Many aristocrats got their names inscribed in stone by risking vast sums on throws of dice and turns of cards. One might go broke with such games, but even an incredible loss had glory in it and at least proved one’s cavalier approach to money. Far better a spendthrift than a miser, but this half-virtue ruined many families. For of course, they did need money just as anyone else did. Tradition mitigated against them developing a trade, speculating, or becoming a merchant. They hoped for an appointment to high ranking government or military posts which traditionally went to high ranking aristocrats. The only way to prove oneself worthy of this honor was not only to have impeccable taste and sense within the pecking order, but also to demonstrate that they never needed to ask the price of anything. They played a dangerous game, one that Louis XIV must have been only too delighted to see them play. As long as the fortunes of the aristocracy ebbed and flowed unpredictably, the greater his power. As one might expect, they thought their habits pointless, wasteful, and weird (so much makeup for the man! )*, and so on. But we must seek to understand. Fundamentally, they sought to dress in ways in which commoners could not possibly dress. They needed to reflect their proper status, for their own benefit, of course. But it went beyond that–it was for the good of society too (at least in their minds). To reflect their station was to give witness to the great chain of being. I think this last point has some merit. But I’m not wearing makeup. So, while Louis did get to set the rules of fashion (being the top aristocrat all matters of taste and decorum flowed down from him), he had to organize methodically his use of power. In order to effectively display the glory of France/himself and set the rules, he had to be “on call” all the time. This lends more sympathy perhaps to the comical and bizarre rituals of various select noblemen watching Louis dress, undress, and eat. I had always focused on the prison the nobles had allowed themselves to enter, but to keep the nobles beholden to himself, Louis had to keep himself beholden to them. He too faced severe constraints on his behavior. 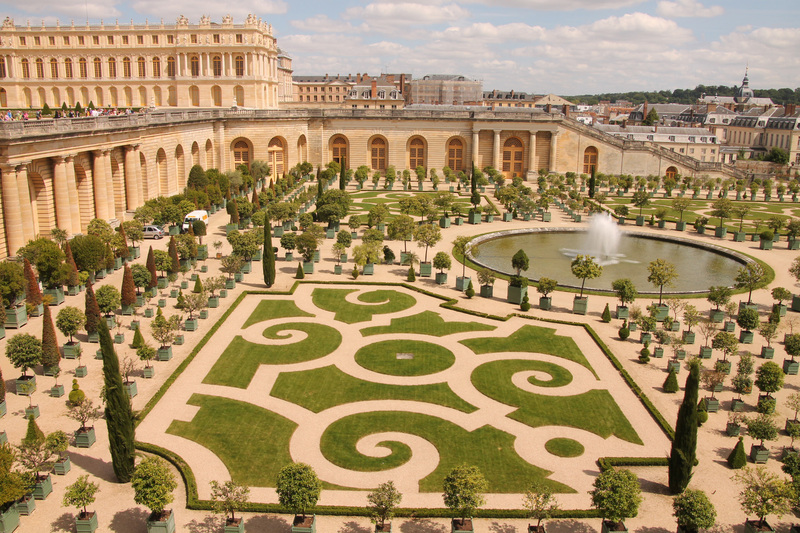 This element of control had to be extended at Versailles to nature itself. 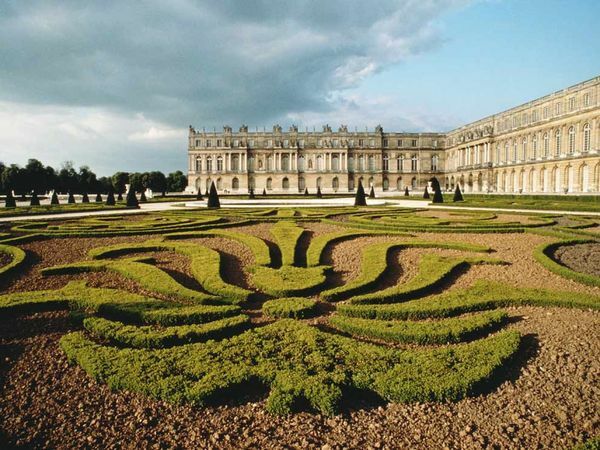 With Louis XIV one has a possible glimpse of the final apogee of the Medieval idea of the Great Chain of Being, where happiness consisted in knowing who you were by knowing your place in the universe, and how that related to redemption of all things. But in what could be called its culmination, the egg goes bad instead of hatching. No wonder so many aristocrats supported the French Revolution, and even supported abolishing feudal titles. One must always take caution when using one’s own culture and experience to judge the past, but perhaps the aristocracy simply got tired of playing a game no one had any real chance of winning. One can make a good argument for the real usefulness of the aristocracy during the medieval period, but that time had long past, and one wonders if the French nobility somehow, deep down, knew that to be true. *Yes, I too am disturbed by the use of makeup. But we must be careful . . . it would not have been too long ago that a woman wearing pants would have been considered a form of cross-dressing. Men wearing earrings takes on different meanings at different times, and so on. President Reagan garnered political popularity and power in part by his skillful use of political theater and imagery. Reagan got himself into this mess through a series of awkward political circumstances. First, West Germany had emerged as a crucial ally in the Cold War and Reagan wanted to put a new kind of missile on West German soil. Second, Chancellor Kohl had engaged in a long campaign of rehabilitation for Germany, and argued that the German people were also the victims of the Nazi regime–a statement most found (and I find) partially true but mostly false. Still, things in West Germany had obviously changed since the 1940’s. Still, rehabilitating the Nazi regime . . . ? Most world leaders balked at any ceremonial recognition. Reagan felt that he needed to acknowledge West Germany’s emerging role and commitment to freedom. Plus, the missiles . . . he needed enough political capital with the West Germans to install them on their soil. So, he decided to go. He asked that the ceremony be limited in time, pomp, and circumstance. He asked his aides to pick a spot that would incur the least amount of political damage. Somehow, in a gaffe of gaffes, his aides picked a spot that included graves of SS officers! One might understand mourning the ordinary German soldier, but not even Reagan could pull this off. Still, Reagan had pledged–but he then insisted on another visit to the Bergen-Belsen concentration camp in last-ditch attempt to balance things out. Hence, his stiff posture at the Bitburg cemetery, and the different messages on the wreaths. The amount of controversy these simple and subtle gestures caused shows us that such gestures are not that simple. Rituals reflect deeply held beliefs. More than that, rituals create beliefs that stick in the minds of men. David Kertzer’s Ritual, Politics, and Power discusses this topic brilliantly. He writes about weighty topics like ritual, psychology, and sociology with a spring in his step, and shares numerous revealing examples across time and space. By far, his is the best book I have seen on the subject. Some of us of a more rationalistic bent might say that rituals have no meaning in themselves. Perhaps they give outward expression to inward meaning, but certainly cannot create meaning. Meaning and ritual can easily part ways. But how far could one take the separation of meaning and ritual? Imagine we felt respect for someone but failed to shake their hand. Would we really have this respect? Some might say, “We love each other and we don’t need the state or the church to tell us that we’re married.” But I doubt that such people would refuse the “act of marriage” that creates intimacy in the first place. “That’s ok, it’s the thought that counts” would not work as a defense. Without a physical embodiment of the thought, no evidence of the thought exists. More than that, our thoughts cannot be said to conform to reality without a physical manifestation of them. We know a tree by its fruits. Kertzer generally ignores religion in his book, but the thin line between religion and politics makes itself perfectly obvious throughout his work–a huge strength in my view. It illumines the fact that our political commitments come very near, or equivalent to, our religious beliefs, consciously or otherwise. One immediately thinks of the vesting of clergy to perform religious rites. We should not be gnostics. You cannot just “think” yourself into being married. Even today we still understand that you need a rite, you need “the act of marriage” to create marriage. We know of the crown, robes, and mitres of kings. But even in our much more casual modern American democracy, we have fixed expectations of how to look presidential. To take one example, presidents give the pens they use to sign laws and treaties to favored confidantes or privileged citizens as “sacred” tokens of leadership. Some may recall how Jimmy Carter’s popularity fell at least in part due to his failure to manage the symbolic nature of his leadership, either in his dress, relationship with Congress, or his tone of voice when speaking. To take an opposite case, Kertzer shows how Rajiv Ghandi skillfully managed the symbolism of his mother Indira’s funeral to make a political career from nothing to India’s youngest Prime Minister in a matter of months. We will know that our country’s religion is changing when we see its basic rituals come under fire. Personally I find the singing of our national anthem at sporting events laborious and excessive. But once the toothpaste gets out of the tube . . . things get complicated. Though I find the ritual onerous and misplaced, I acknowledge the power of the rite. Objectors to singing the anthem wisely engage in a symbolic action of their own. The fact that they kneel has much more power than holding a press conference to voice their objections. The more our country moves away from religion and its overt religious rite and symbolism, the more we will seek it elsewhere, the more important our political symbols will likely become, and the more power their proper execution will confer. Ritual, Politics, and Power makes it clear that we need symbols to make sense of reality, and will have them one way or another. *What do our modern presidential elections decide? Given entitlement and defense spending, our federal budget has very little room to maneuver. Our system of government and regular elections keep the president more or less in check. Many believed the world would soon end after Trump’s election, but little of real substance has changed. I think Kertzer would argue that what is most often really at stake is who gets to craft our symbols. Neither candidate proposed any radical policy measure, and when Trump talked about a wall few thought it would actually happen. But . . . it symbolically meant something to talk about it. The election was bitter and contentious because of the symbolic nature of the candidates. They may not have actually done radically different things in office but they represent very different symbols of what America is or should be. This week we continued with many of the same themes as last week, with a special focus on Galileo. [W]hen from time to time there are offered for one and the same motion different hypotheses…, the astronomer will accept above all others the one which is easiest to grasp. The philosopher will perhaps seek the semblance of the truth. But neither of them will understand or state anything certain unless it has been divinely revealed to him…. So far as hypotheses are concerned, let no one expect anything certain from astronomy which cannot furnish it, lest he accept as the truth ideas conceived for another purpose and depart from this study a greater fool than when he entered it. began to affirm that the heliocentric hypothesis not only ‘saved the appearances,’ but was physically true.” What they professed was in fact a new theory of the nature of theory; namely that, if a hypothesis saves all the appearances, it is identical with truth. What (I think) Barfield meant by the idea of “saving the appearances” was the old idea that our notions of scientific truth should do their best to explain the reality that we see around us, to preserve the validity of the senses. However, this was always recognized to represent our “best guess” and may not reflect actual truth. if theologians could not refute Galileo their case [would] go by default, and Scripture must be reinterpreted. This implied (though Galileo did not dare state it explicitly) that the truth of the system was rigorously demonstrated. It is all so subtly done that the trick is almost imperceptible to the reader and, as far as I know, has escaped the attention of students to this very day. Yet it decided the strategy he was to follow in the coming years. Galileo was right about the Earth’s rotation around the sun, though we would later discover that the sun, too, is in motion. The issue that I wanted to stress to the students, however, was the fact that one can be right for the wrong reasons. Many great scientific minds of this time were likely sincere Christians, but the ways which they reached their conclusions may have helped lead people away from Christianity. True knowledge must involve more than what we see with our senses. The Scientific Revolution also raised the question of how we should interpret Scripture. To what degree should scientific discoveries impact how we read the famous passage about the sun standing still in Joshua? Of course the Church made mistakes at this time too. In condemning Galileo they surely overreached and made themselves look silly, contributing to an unnecessary and unhealthy divide between science and faith that lasted for at least three centuries, from which we have fully to recover. I repost this wonderful offering from my friend and colleague Bill Carey . . .
A Gallup poll of 6 July 1999 of more than a thousand adults determined that only about four out of five Americans believe that the Earth orbits the Sun. Fully one in five believes that the Sun orbits the Earth. It’s interesting that four in five Americans believe something that seems obviously and demonstrably false. The Earth doesn’t feel like its moving underfoot, and every day we see the Sun rise and set. We believe the moon orbits the Earth, and it sure looks like the behavior of the Sun and moon is pretty similar. Why do four out of five Americans believe that, contrary to our intuition, the Earth orbits the Sun? I’ve been taking an informal survey of my friends, with just two questions. The first is whether the Earth or the Sun is the center of the solar system. After I assure them it’s not a trick question, everyone answers the Sun. We’re beating Gallup’s averages. The second question confuses people: “How do you know?” The most common answer I’ve gotten is, “Duh, everyone knows that”. Some people know that Copernicus and Galileo got in trouble with the Church for saying the Sun was the center of the solar system. Others vaguely remember a science or history teacher telling them about “heliocentrism”. Fair enough. When I rephrased the question to ask how human beings originally figured that the Earth orbits the Sun, my friends gave me a quizzical look. I was no better off than them; I knew that Galileo and Copernicus had gotten everyone to switch from the geocentric view to the heliocentric. I didn’t know how or why. How did those astronomers convince everyone to abandon more than a thousand years of careful science and replace it with a new framework? What arguments and data struck the telling blows for heliocentrism? The work that I turned to to understand the arguments for heliocentrism is Galileo’s delightful Dialogue Concerning the Two Chief World Systems. It is a surprising book. The first surprise it delivers is its style and structure. Galileo imitates a Socratic dialogue. Like all good literature, conflict drives the plot of the Dialogue. In particular, the conflict between Ptolemy and Aristotle on the one hand, and Copernicus on the other, motivates Galileo. His protagonist, Salviati, argues for the Copernican world system. The canny, initially neutral Sagredo drives the conversation forward. 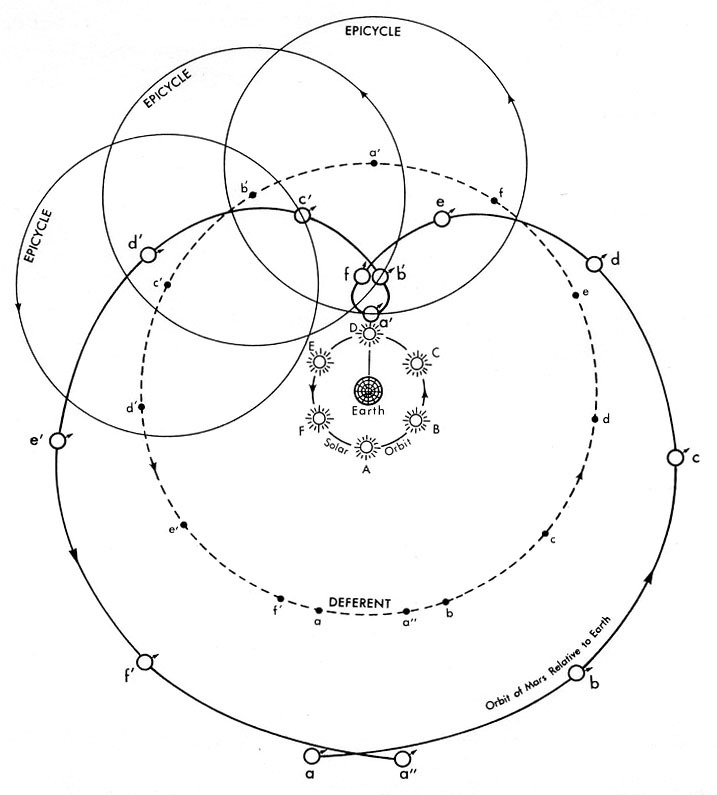 The wryly named Simplicio attempts to prop up the Ptolemaic system. Simplicio’s bumbling affords Galileo an opportunity to clearly articulate his ideas about physics and the motion of the stars. Of Aristotle, Salviati says that “[w]e need guides in forests and in unknown lands, but on plains and in open places only the blind need guides. It is better for such people to stay at home, but anyone with eyes in his head and his wits about him could serve as a guide for them. In saying this I do not mean that a person should not listen to Aristotle; indeed, I applaud the reading and careful study of his works, and I reproach only those who give themselves up as slaves to him in such a way as to subscribe blindly to everything he says and take it as inviolable.”  The arguments about the motion of the heavens make the work science; the metaphors, plot, dialogue, and humor make it literature. The second surprise in the Dialogue is Galileo’s outstanding ear for argument. He refutes Aristotle’s arguments bluntly and often amusingly. Aristotle claims that a ball of iron will fall one hundred cubits in the time a block of wood falls ten cubit. This is preposterously false, and Sagredo doubts whether Aristotle ever actually tried it out: “I greatly doubt that Aristotle ever tested by experiment whether it be true that two stones, one weighing ten times as much as the other, if allowed to fall, at the same instant, from a height of, say, 100 cubits, would so differ in speed that when the heavier had reached the ground, the other would not have fallen more than 10 cubits.” Simplicio leaps to the defense of his preposterously wrong philosopher by pointing out that “[Aristotle’s] language would seem to indicate that he had tried the experiment, because he says: ‘we see the heavier’; now the word ‘see’ shows he had made the experiment.” Galileo’s characters are forthright in dismissing this tomfoolery. They describe experimental procedures that we can repeat today that confirm Galileo’s ideas and to refute Aristotle’s. 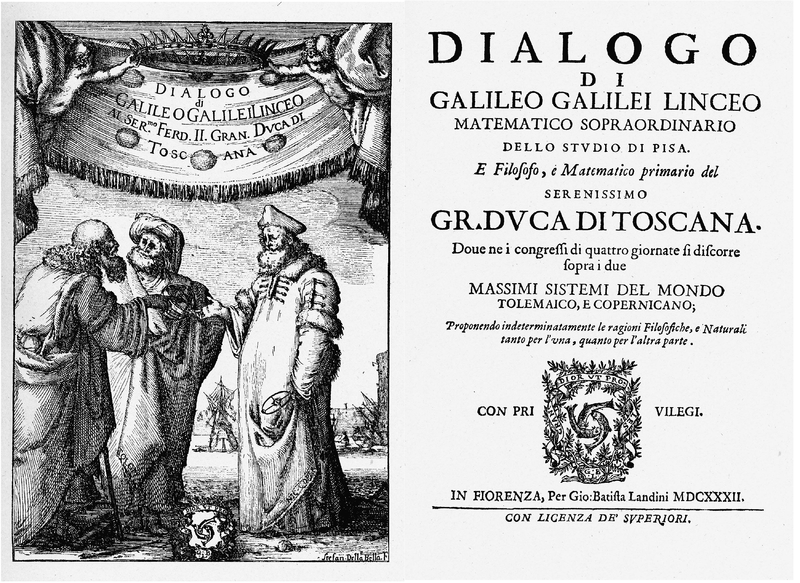 Claudius Ptolemy offers Galileo a foil with more scientific substance. Ptolemy’s exposition of the geocentric world system in the unreadably complex Almagest is a surprisingly empirical and scientific work. Ptolemy’s system of deferents and epicycles is a compelling, mathematically precise, vision of the world. To refute it, Galileo works through a detailed analysis of the parallax of various celestial bodies and their distances from the Earth. The argument is technical and subtle. Writing before the great tectonic shift from Euclid to Descartes, Galileo’s mathematical reasoning tends towards geometry as well. Here he argues with Ptolemy on the latter’s home turf. A good edition that reproduces the figures is essential, as the characters lean on them as much as the reader. When a character references a table of astronomical data, Galileo’s language leads one to vividly imagine the characters sitting around a table passing papers to one another as they eat and drink. The third surprise nestled in the Dialogue is that it’s deeply unsatisfying. It’d be tempting to say that, having read Galileo’s dialogue, I can answer the question about how we know the Earth goes around the Sun. The truth, though, is that I’ve just replaced one authority with another. I haven’t observed the phases of Venus, and I haven’t observed the parallax of the fixed stars (much less of the planets) that would let me work out the celestial mechanics on my own. Even so, reading Galileo’s argument is valuable. When I trust his authority, it’s an authority that I understand a little better than before. It’s an authority that’s grounded in reason and argument that I can wrestle with and assess critically. But if I want to add to the conversation myself, take a stand along with Ptolemy and Galileo, I need to telescope-up and start looking at the stars. Too often we treat science as an Athena, sprung full grown and clothed from the head of Zeus. We trust our predecessors when they say that the Earth orbits the Sun without understanding how they came to believe that. We belittle people who disagree without understanding the arguments that make us correct. It turns out that the story of scientific discovery is always messy, usually fascinating, often wildly contingent, and occasionally well told. Whenever we can grapple with not only the results of scientific inquiry, but also the story behind it, we should. In his preface to the Dialogue, Einstein writes that, “[t]he leitmotif which I recognize in Galileo’s work is the passionate fight against any kind of dogma based on authority.” Galileo would rue his fate; like Aristotle before him, he’s become an authority, chalky and dead. We can rescue him from that cruel fate by listening carefully to the scientific conversation and the adding our voices to the tumultous banter. An astute reader pointed out to me that I beg the question here, so ingrained is the heliocentric system in my mental picture of the universe. Ptolemy will be the subject of another post, I hope. He deserves far more credit as a scientist than we’re inclined to give him. This week we continued our look at the Peloponnesian War and especially at Athens’ crucial decision regarding their ally Platea. Platea had been a long time ally of Athens, and a strategically important one because of its geographical location near Thebes, a Spartan ally. Sentiment and history also bound Athens and Platea, as these two city-states were the only ones to show up at the Battle of Marathon. Thus, they forged their alliance not just out of mutual need but out of a shared history. As part of their strategy the Athenians purposely decided to use their infantry sparingly, and rely on their navy to win the war. Unfortunately almost immediately Thebes took the opportunity to attack Platea and add to their territory. Platea had success in their initial resistance but knew that ultimately they could not outlast Thebes and would lose. They asked for Athenian help. Usually of course, allies come each others’ aid. But in this case, Athens wasn’t so sure. To get to Platea would mean fundamentally altering their strategy for the entire war. Using Athenian infantry meant exposing their own city to attack by the more deadly Spartan infantry. The chances of the Plateans maintaining control after the Athenians inevitably left were slim. How should they respond? The dilemma the Athenians faced is akin to what we faced regarding West Berlin in the Cold War. Undoubtedly it was a great coup to have part of a significant city be “on our side” right in the heart of the Iron Curtain. West Berlin stood as a constant embarrassment to the puppet regime in East Germany. President Kennedy made this famous speech regarding the city. But surely much of our talk regarding West Berlin was bravado. The city remained immensely vulnerable, and we had no way of guaranteeing its security. If they were attacked, the best we could do would be to retaliate somewhere else. Would defense of this city truly be worth a world war? If push came to shove, should the U.S. let its bluff get called, or would we go “all in” on West Berlin? Though the issue doesn’t have the relevance it once did, the problem of Taiwan and China also has resonance with the Athenian dilemma. In the aftermath of communist takeover of China, the nationalists fled to Taiwan. Taiwan had a long history of being a part of China, but the communists lacked the naval strength to take the island from the nationalist party. We immediately recognized Taiwan as the “true China” and pledged its defense. Early on this was almost as easily said as done. China had no real navy or air force. Recently of course, this has changed. Their navy has greatly improved, and they have the world’s largest air force. Defense of Taiwan has become a much more difficult problem. Not only are they so far away, not only would defending Taiwan require large amounts of our naval resources, war with China would cost a great deal more now than even 25 years ago. When push came to shove, would we truly risk so much for Taiwan’s sake? For the most part the students agreed that Athens really shouldn’t help Platea, and neither would they really have started World War III over West Berlin. This prompted the question, “Are democracies more likely, less likely, or just as likely to keep these kinds of alliances as other forms of government (such as monarchies or oligarchies). If we believe that different forms of government have their own personalities, their own strengths and weaknesses, then we might expect them to act differently in different circumstances. Some might point out that aristocratic governments might indeed be more willing, for aristocracies have a great deal in common across national lines. A duke in country ‘X’ has more in common with a duke in country ‘y’ than he does with a factory worker in his own country. Thus, alliances between aristocratic countries will be more personal, and less politically abstract. Some suggested that since monarchies and aristocracies rely much more on tradition than democracies, the past assumes much more importance for them — thus past alliances hold more weight. Often aristocracies put a strong emphasis on a shared honor code, and this too might give them more internal incentive to keep past agreements. Thus, he concludes that aristocracies can be driven much more by ideas than democratic countries, who will usually use “practicality” as a guide for their decisions. Whether or not De Tocqueville is correct, the issue of alliances and when to uphold them will always be relevant. Athens preserved its infantry by refusing to come to Platea’s aid (to be fair to Athens, much of their population was stricken with a deadly plague) but Platea paid the price. They succumbed to a joint Theban/Spartan attack. The Thebans executed all their men, and sold their women and children into slavery. Platea simply ceased to exist. Next week we will see how the war expanded and changed its character as time went on.